This is critical because most histories of marijuana prohibition start in the early twentieth century and generally focus on the actions of Harry J. Anslinger, Commissioner of the Federal Bureau of Narcotics. Existing narratives have suggested various causes for passage of the Federal Marihuana Tax Act in 1937, including: a grand conspiracy by the DuPont Company and newspaper magnate William Randolph Hearst, the “Reefer Madness” campaign of the 1930s, and blatant racism toward Mexican and African American marijuana smokers. Aspects of these issues surely played a role, but relying on them to explain marijuana prohibition or argue why it should now be overturned ignores a far longer and more complex history of cannabis regulation in the United States. Introduced in North America as the common hemp plant during the seventeenth century, commentary on the medicinal and intoxicating properties of cannabis did not formally emerge in the United States until the mid-nineteenth century. Spurred by a series of European medical experiments, especially those of Dr. William Brooke O’Shaughnessy in 1839, American doctors began experimenting with cannabis and medicinal preparations were readily available in American pharmacies by the 1850s. What emerged from contemporary medical and literary sources – both including a great deal of personal experimentation – was a distinctive blend of scientific inquiry and artistic expression that fed a wide-ranging understanding of cannabis and its effects and lasted well into the twentieth century. On the eve of the Civil War, classifications of cannabis included: hypnotic, anodyne, narcotic, stimulant, poison, and intoxicant. What was almost always present, however, was the ready classification of cannabis as a potentially dangerous substance, even among those who found it useful in a variety of medicinal treatments. In short, cannabis, like most all drugs, could be both helpful and harmful. Cannabis products were commonly labeled “poison” under state laws. 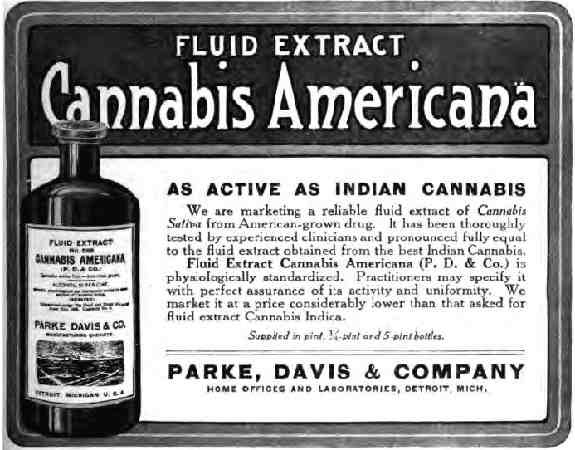 This understanding landed cannabis alongside opium and other drugs as the targets of broad, state-level efforts to regulate the sale of medicines and poisons throughout the second half of the nineteenth century. For example, an 1860 New York law stipulated that “no person shall sell or give any poison or poisonous substance, without recording in a book to be kept for that purpose, the name of the person receiving said poison, his or her residence (together with the name and residence of some person as witness to such sale), excepting upon the written order or prescription of some regularly authorized practicing physician, whose name and residence shall be attached to such order.” The law also required the labeling of vials, boxes, and parcels with the “name and residence of such person” as well as “poison”– all in red ink– with the precise name of the poison written in “plain and legible characters.” In a move quite common for the period, Wisconsin passed a similar poison law in 1862, evidently drawing its list of poisons directly from New York. Various restrictive regulations throughout the country also created penalties for adulterating drugs, improper packaging or labeling, sales or transactions with minors, and improper prescription refills. Laws of this nature ultimately formed a foundation for growing restrictions surrounding the sale and distribution of drugs in the United States. 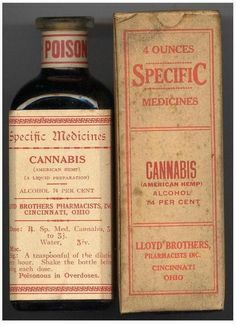 Of particular interest here is the inclusion of cannabis alongside arsenic, chloroform, opium, and many others, in these laws and other enumerated lists of poisons. We cannot, however, rely solely on such lists to fully capture the extent of dangerous perceptions surrounding certain drugs and attempts to remedy these problems with state regulation. Though most laws that identified specific poisons did include cannabis, there was actually significant debate on whether or not to include poison lists in legislation at all. New York, for example, removed its original list just two years after the law initially passed. For their part, the American Pharmaceutical Association declared the enumeration of poisons by law “objectionable.” They argued these lists would be incomplete at best, and could burden law enforcement while limiting the effectiveness of the legislation. Nevertheless, the APhA developed a model state law which it circulated to politicians and medical doctors across the country. While the legislation had mixed success, within a decade nine states and the District of Columbia had adopted similar statutes. Though few of these laws would fit today’s understanding of drug prohibition, they were legal restrictions on drugs nonetheless. They represented attempts by individual states to regulate access to substances deemed potentially dangerous by medical doctors and pharmacists at a time when few people, if any, believed the federal government could legally do so. In the case of cannabis, its inclusion in these laws did not require a grand conspiracy by corporations and newspapers, a sensational “reefer madness” campaign, or xenophobia against groups of Mexican or African American users. Indeed, though medical doctors used and tested cannabis products regularly throughout the second half of the nineteenth century, most deemed it potentially dangerous, even as they discovered it did not carry a lethal toxicity. In some ways, these laws reflect aspects of the medical marijuana legislation enacted in the past twenty years. That historical precedent is very interesting given our current state of affairs and the ongoing debate about broad recreational legalization. In part two, I’ll explore how these nineteenth century regulations evolved in the early twentieth century as the federal government exercised increasing authority over drug control with the Food and Drug Act, the Harrison Narcotics Act, and the Marihuana Tax Act. Adam Rathge has a multiple part series at Points blog on the road to the criminalization of marijuana. This is part one and it explores how cannabis was categorized as a poison along “arsenic, chloroform, opium, and many others.” Rathge essays posits that the criminalization of marijuana had its roots in the 19th century.